An allergy is the body’s immune system’s rejection of a substance or foreign invader. In reaction to the foreign invasion of allergens, the body sends out a group of white blood cells called T-cells to fight off the invaders. In skin allergic reactions, this causes redness and irritation. Your risk of developing an allergy isn’t necessarily related to something being natural or chemical, but instead, it can be related to your family’s health history. Seasonal allergies and their related symptoms are different. 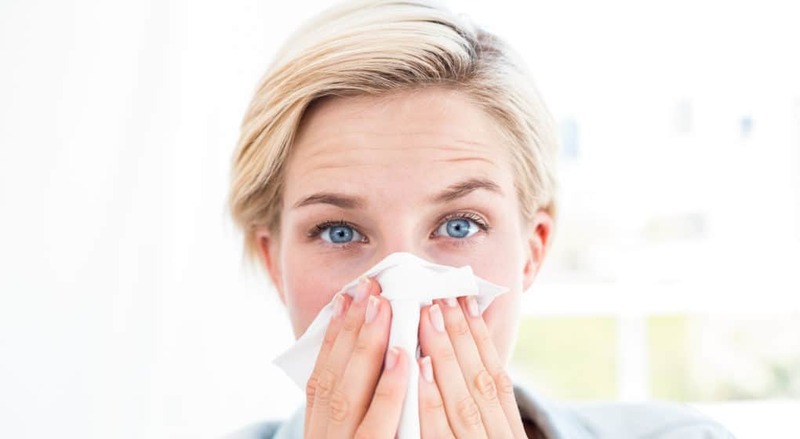 The signs and symptoms can include runny nose, sneezing, itchy, red or irritated eyes which may seem dry - and notably can include skin reactions. Allergies can make you feel drained and unable to participate in outdoor activities and, when severe enough, can break down your immune system and play havoc on your lymphatic system. By preparing ahead of time, you can help to combat the symptoms associated with allergies. Seasonal allergies start in the spring, for some states as early as February, and continue through early summer. Our first concern is tree pollination, which begins yearly in the spring. We get a little reprieve before the late spring to early summer grass pollination begins. Then in late summer and early fall, we are fighting ragweed. In the more tropical climates, grass may continue to pollinate throughout most of the year. When plants pollinate can also vary, depending on changes in usual temperatures or an unusually rainy season. Ragweed can grow almost anywhere and is most heavily in the Midwest and the Eastern Coast. It is the biggest culprit for allergies. Once ragweed starts blooming, it will release pollen from August through November. In many areas of the country, ragweed pollen levels are highest in early to mid-September. Aside from ragweed, other concerns include underbrush burning, cockleburs (Xanthium), lamb’s quarters (Chenopodium album – also known as pigweed, it is delicious and nutritious), Amaranth (Amaranthus retroflexus - another edible and nutritional food), Sagebrush, the flowering family Asteraceae, Mugwort (Artemisia vulgaris), and Russian thistle (Echinops exaltatus). There are many other factors, such as high humidity or heat, that may heighten your symptoms. Ways to help control your allergies include checking the weather channel or the internet for the daily pollen count in your area, keeping windows and doors closed, and keeping the moisture level down in and around your home to avoid mold and mildew growth. We should also note that, although rain washes away pollen (all that yellow is gone, after all), pollen counts can skyrocket after rain. When possible, avoid outside activities on dry windy days. On pollen days, take a shower to wash away any possible pollen on you or in your hair. It’s not a good sleeping partner. If you work outside often, wear protective gear such as a NIOSH-rated 95 filter mask, especially if you are mowing or doing other activities that stir up the pollen. Can Essential Oils Fight Allergies? Essentials oils play a terrific role in fighting off or preventing allergies. Many have strong therapeutic properties to combat airborne microbials, as well as bacteria of many strains. They can also support and boost the immune system, work as antihistamines, and open congested airways. Those who do not want to take prescription medication or over-the-counter seasonal allergy medications may find great relief by simply inhaling essential oils. I have combated my own allergies successfully with aromatic treatment. With science-based research, we’ll walk you through the top 10 essential oils that can help you control or, in some cases, rid you of your allergies. Since we are all unique individuals, one remedy cannot work for all. The oils I’ll introduce do work for most. Play around and find what suits your unique and personal chemical makeup. Many of the following suggested oils contain the chemical family monoterpenols, which contain components that are excellent immune stimulators, strong anti-infectious components, and much more - dependent on the individual oil. There are several applications for using essential oils; diluted topically, diffusion, steam inhalation, or inhalation through inhalers. When fighting allergies, inhalation is the best application for essential oils. Diffusion and inhalers are perfect. You can use diffusion at home and inhalers at home or on the go. As a precaution, and to avoid possible neurological side effects, it’s best to diffuse no more than 30/60-minute intervals with a 30/60-minute break. Diffusion all night is not recommended. You can purchase inhalers and diffusers online. I’ve been asked many times, “If diffusion should be limited, then why do they make diffusers for longer?” My short answer is I would imagine that diffuser manufacturers are not trained in safe use of essential oils. Steam inhalation is a quick relief for congestion. By bringing a quart of water to a steaming point (not a boil) and adding no more than 1-2 drops of essential oil, you can open your airways for easier breathing. Once your water is heated, turn it off and carefully transfer to a heat-resistant bowl, add your essential oils, cover your head like a tent to keep the steam in, and while keeping your eyes closed, take deep cleansing breaths. After, let the water stand to release the rest of the essential oil molecules into the air to help combat airborne microbials. Inhalers are quite easy to assemble, take no more than 15 drops of essential oil, and last for several weeks, depending on usage. You can also use your blends topically to enhance their effect. Nighttime application on the chest and neck will allow you to inhale as you drift into sleep, giving you added protection. I do this by adding my blends to a nice unscented lotion or a carrier oil that compliments the skincare properties of the oils. For those that suffer from skin allergies, you’re covered too. Diffusing and inhalation can certainly help, especially if your skin allergies are related to your seasonal or inherited allergies. Topical applications using selected essential oils and carriers that compliment blends for skin healing properties can reduce and may even eliminate skin allergies. When looking at supportive essential oils for allergies, we look for essential oils that fight allergy pathogens and associated symptoms, support the immune system, and help open airways. Of course, essential oils come with the added benefits of having other therapeutic actions that can keep us healthy and support us emotionally. For children, hydrosols are a good place to start. Hydrosols are plant waters distilled specifically for their therapeutic actions. It’s a misconception that they are the water left behind after essential oil distillation. The aromas are much lighter and, in some cases, may not even smell the same but the therapeutic benefits are there. You can indeed diffuse hydrosols through the night and, for that matter, use them topically and even ingest them. They are perfect for small children and pets, where the harsher oils need to be avoided. Hydrosols are often underestimated in their powerful actions. Sweet Basil oil contains eugenol and terpinene-4-ol, two strong components, that even in small percentages pack a punch in assisting with respiratory issues that can arise from allergies, colds, strains of the flu, or viruses. Two components present in basil are eugenol and terpinene-4-ol are antihistaminic. Basil is also an antispasmodic, antiviral, expectorant, and supportive to the immune system. It quickly relieves spastic coughs. There are no safety concerns. Like all citrus oils, Bergamot contains d-Limonene, a component that is known for its strong supportive actions to the immune system and its action as an antispasmodic by calming spastic coughs. Bergamot is best blended at 0.4% or less. Blending with oils such as eucalyptus (active against pathogens) adds an extra punch. Since both come with suggested maximum dilution rates, dilution rates need to be kept at a lower percentage to compensate for two or more skin irritant oils. For example, if blending two skin irritants with a maximum of 2%, to compensate for the two oils, blend at 1%. Also, blending with skin-friendly oils as well as an antioxidant such as Vitamin E lessens the chances of a reaction. Skin friendly oils include lavender (Lavendula angustifolia), any helichrysum, cedarwood (Juniperus virginiana), patchouli (Pogostemom cablin), sandalwood (Santalum album) and vetiver (Vetiveria zizanoides) and are some nice choices. You should not wear bergamot on the skin in the sun or tanning bed. Like all citrus except sweet orange, it is phototoxic. German Chamomile is an antihistaminic as well as an anti-allergenic. It’s antiviral and may relieve the bronchoconstriction which often accompanies allergies. Chamazulene present in German chamomile is an antihistaminic. There are no safety concerns. Helichrysum italicum contains neryl acetate, an airborne antimicrobial, analgesic, and antioxidant, anti-inflammatory, antibacterial, antispasmodic, antiviral, and - most importantly - anti-allergenic. Skin or seasonal allergy symptoms can include itching, swelling, and discomfort. Helichrysum can relieve these symptoms that often manifest from allergies. Helichrysum has no safety concerns. Often acne can be a reaction from allergies. Juniper serves as an excellent astringent due to its antiseptic actions. It’s skin healing, anti-inflammatory, and cleanses. It also helps to increase the healing, is an immune stimulant, and activates white blood cells. There are no safety concerns, although if oxidized, it can irritate the skin. Like all citrus, lemon is high in d-limonene. Lemon is another great astringent as well as an antioxidant, skin penetration enhancer, antibacterial, and immune stimulator. Skin penetration enhancers help along other essential oil constituents that normally penetrate the skin. Just like all citrus, it’s supportive of the immune system. Follow previous cautions for citrus oils. Lavender is an anti-allergenic, anti-inflammatory, antibacterial, and anti-fungal that supports the immune system, skin healing, has decongestant action, and more. It blends well with German chamomile for allergies, with tea tree and/or thyme ct. linalool for infections (including fungal infections and candida), and with Helichrysum italicum for trauma as well as healing. There are no safety concerns for lavender, however, do not confuse it with spike lavender. Niaouli is distilled from the leaves of the niaouli tree, a member of the myrtle family, which grows in the wilds of Madagascar. Niaouli has several different chemotypes indicated by the ‘ct’. Niaouli is excellent for supporting healthy lung and airways, asthma, coughs, and chronic bronchitis, along with combating allergies and related symptoms. Niaouli is also supportive of the immune system. Use caution with asthmatics. Avoid if pregnant and with children under 10 years of age. This oil is often adulterated so only purchase from companies with gc/ms analysis reports available. Like all citrus oils, Sweet Orange contains high quantities of the component d-Limonene, which is supportive to the immune system as well as activating white blood cells. Sweet orange is a skin penetrator enhancer and is a great addition to topical applications. Sweet orange is not phototoxic as most other citrus oils are. Palmarosa is an airborne antimicrobial. Palmarosa is over 70% in the component geraniol, an anti-fungal, airborne antimicrobial, cicatrisant, and anti-inflammatory. Palmarosa is an emotionally supportive oil, both calming and uplifting. Patchouli is the perfect choice for fungal related allergies. As to the respiratory system, fungal spores (which are smaller than pollen grains) may induce allergic asthma when they are inhaled into the lungs. Using patchouli in an inhaler may help reduce the chances of an allergic reaction. Patchouli has been shown to stimulate the immune system, is anti-bacterial, and has a cooling effect, which is nice on skin allergies. It’s great in insect repellants as well, so you get double protection outside. Patchouli is also an anti-inflammatory and can ease topical inflammations caused by allergies. Ravensara leaf requires a low dilution but packs a powerful punch against allergies. Topically, Tisserand recommends for those over 15 years of age the topical maximum of 1%, 6-15 years old, 0.5 and those 2-6, a maximum of 0.25%. You should not use ravensara on those under the age of 2. When blending with this oil for children, my recommendation is 0.0625% or less, depending on the child. You should not use ravensara during pregnancy. Rose absolute is an antispasmodic and works as a bronchodilator. Citronellol has direct vasorelaxant action on vascular smooth muscles. It’s likely that rose has antispasmodic effects. The main component of the absolute, phenylethyl alcohol, alleviates histamine-induced bronchoconstriction (in vitro) and has potential as an anti-asthmatic agent. Sweet Marjoram contains terpinene-4-ol and can be used in blends designed to alleviate skin inflammation and allergies, and for healing the skin. It’s a powerful sleep aid, which can help those allergy-related restless nights. Sweet marjoram has possible asthmatic relief actions; it’s anti-inflammatory actions helps ease discomfort in airways. It can be used with other oils to relieve bronchoconstriction, especially helpful for those with bronchial asthma. Sweet marjoram has no safety concerns, but to avoid topical irritation, the suggested maximum for adult normal skin is 2.5% or 25-27 drops per ounce of carrier oil. Tea Tree oil is an antispasmodic and bronchodilator. It’s great in a steam to keep congestion and infection under control. Most respiratory conditions can benefit dramatically from the use of tea tree oil, including those related to allergies. Tea tree is a cicatrisant, decongestant, eases bronchoconstriction, eases coughs, is an immunostimulant, and works great with oils high in the component (constituent) linalool. Tea tree is prone to oxidize, as are citrus oils. When using oils that may oxidize in your products, you can add Vitamin E, a great antioxidant, between 0.1-0.2% per ounce. Here are a few of our favorite blends for fighting allergies that can be used in the various applications outlined. Nine drops to one ounce of a carrier is approximately 1%. We say approximately since orifices can vary depending on the company you purchase your essential oils from. For children, reduce 2% blends down to 1% or as advised per noted safety. For children under 10 years of age, replace with Rosemary Rosmarinus ct. 1,8 cineole with Rosemary Rosmarinus officianalis ct. verbenone. Safe for all ages, following appropriate dilution rates. Due to bergamot, avoid the sun and tanning beds for at least 24 hours after use. Patchouli has antiplatelet aggregation activity and it should be avoided if breastfeeding as it could be passed in the breastmilk. As noted above, with niaouli, use caution with asthmatics. Avoid if pregnant and with children under 10 years of age. Based on the information provided, now it’s your turn to get creative with your blends, keeping in mind dilution rates, applications mentioned, and the safety precautions we have provided. Koh, K., Pearce, A., Marshama, G., Finlay-Jones, J. and Hart, P. (2002) Tea tree oil reduces histamine-induced skin inflammation. British Journal of Dermatology 147, 1212-1217.